The Kids Are Alright: Is the ABC TV Series Cancelled or Renewed for Season Two? Are the Clearys surviving the ’70s? Has The Kids Are Alright TV show been cancelled or renewed for a second season on ABC? The television vulture is watching all the latest cancellation and renewal news, so this page is the place to track the status of The Kids Are Alright, season two. Bookmark it, or subscribe for the latest updates. Remember, the television vulture is watching your shows. Are you? An ABC sitcom, The Kids Are Alright stars Michael Cudlitz, Mary McCormack, Sam Straley, Caleb Foote, Sawyer Barth, Christopher Paul Richards, Jack Gore, Andy Walken, and Santino Barnard. The 1970s-period comedy centers on the Clearys, an Irish-Catholic family living on the outskirts of Los Angeles. 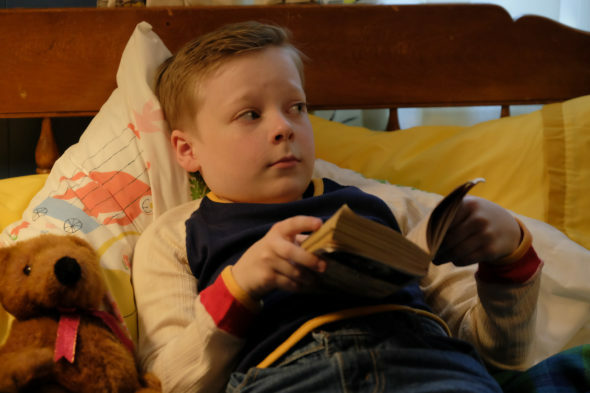 Since its the ’70s, Peggy (McCormack) and Mike (Cudlitz) are raising their kids with a lack of supervision which might stun today’s parents, and now their eldest son wants to quit the seminary to go “save the world.” The times they are a-changing, and the Cleary family is not immune to the turbulence around them. The first season of The Kids Are Alright is averaging a 0.87 rating in the 18-49 demographic and 4.15 million viewers. Find out how The Kids Are Alright stacks up against other ABC TV shows. As of April 23, 2019, The Kids Are Alright has not been cancelled or renewed for a second season. Stay tuned for further updates. Will ABC cancel or renew The Kids Are Alright for season two? The ratings aren’t great and they keep dropping so I’m thinking it’s going to be cancelled. I’ll keep an eye on the ratings and update this page with breaking developments. Subscribe for free alerts on The Kids Are Alright cancellation or renewal news. TV show ratings are still important. Follow The Kids Are Alright‘s weekly ups and downs. Find more of The Kids Are Alright TV series news or other ABC TV show news. What do you think? Do you hope the The Kids Are Alright TV show will be renewed for a second season? How would you feel if ABC cancelled this TV series, instead? Splitting Up Together: Is the ABC TV Show Cancelled or Renewed for Season Three? Speechless: Is the ABC TV Show Cancelled or Renewed for Season Three? Splitting Up Together on ABC: Cancelled or Renewed for Season Two? Child Support: Is the ABC TV Series Cancelled or Renewed for Season Two? Imaginary Mary: Cancelled or Renewed for Season Two on ABC? This is a terrific show!! !You just have to understand the sarcasm and know that is how not to raise kids. Please Please Please renew!!!!!!! Love this Show! It deserves to be Renewed! the Ratings maybe low because they put the bachelor and Modern Family in it’s place instead of continuing it every week!, plus they put the Housewife Show and moved the Connors! More Exposure/Advertisement and it will do fine! The Kids are alright is a great show. Very funny and written very well. Please keep it on.